Peas are well known for being a source of highly bioavailable protein. Additionally, peas are not considered one of the major dietary allergens. Collectively, this makes pea protein an ideal source of post-workout nutrition for athletes who may have difficulty supplementing with other types of protein. 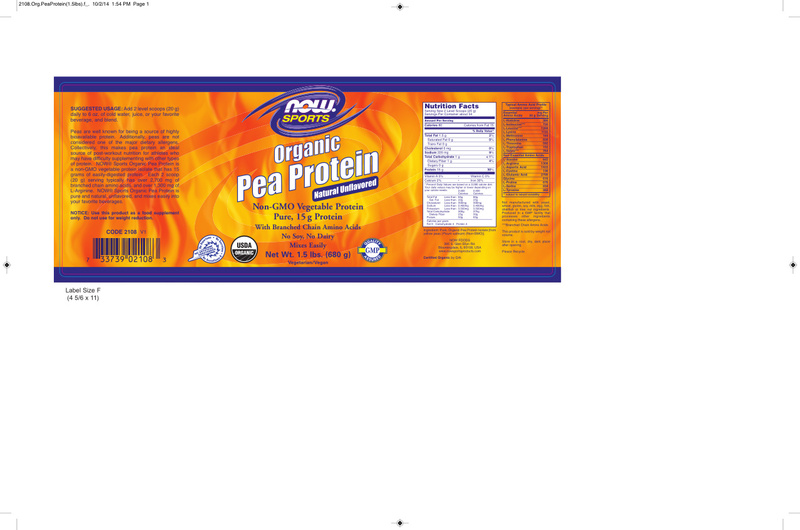 NOW® Sports Organic Pea Protein is a non-GMO vegetable protein isolate that has 15 grams of easily-digested protein. Each 2 scoop (20 g) serving typically has over 2,700 mg of branched chain amino acids, and over 1,300 mg of L-Arginine. NOW® Sports Organic Pea Protein is pure and natural, unflavored, and mixes easily into your favorite beverages. Add 2 level scoops (20 g) daily to 6 oz. of cold water, juice, or your favorite beverage, and blend.